The business community is joining citizens in rising up and taking on Donald Trump and the GOP. Rather than being cowed by this new government, the voices of dissent are increasing. 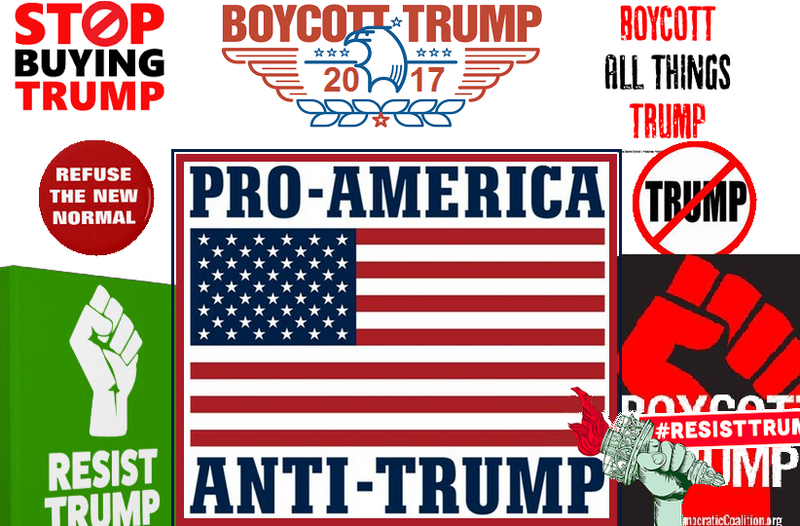 With growing boycotts of Trump-related products, people are challenging this administration in ever increasing numbers. Hundreds of America's leading companies are actively resisting Trump. Hotels and buildings have dropped the Trump brand, and now retail outlets and others are also coming together to say "no" to the new administration and the GOP. We are seeing increasing evidence of a movement to resist Trump. The movement against Trump and Republicans has been building steadily since November 8. Shortly after he was elected business leaders challenged his stance on climate change and urged him not to kill the Paris Agreement. Now this movement appears to be going into high gear. Businesses are resisting Trump's use of the Oval Office as a bully pulpit. Many are appalled that he is using the institution of the presidency to attack corporations. This is yet another example in a long list of highly questionable actions from Trump and the GOP. Businesses cannot avoid the realization that this administration augurs a dystopia that is devoid of ethics. Trump has bullied companies like Boeing, Carrier, and Ford. In the Boeing incident, he threatened to cancel the contract for some new Air Force One jets and this caused Boeing's stock to plummet. However, more recently Trump's twitter tirades against other companies have had the reverse effect. The fact that businesses can stand up to Trump and increase their value in the process changes everything. Corporations now have an incentive to resist Trump. Further, they can use their financial might and messaging wizardry to offer a counter-narrative that gives voice to the outrage building against the billionaires that have taken over Washington. The collective power of the business community to counter Trump and the GOP's dark narrative were in evidence in the recent Super Bowl ads. During the Grammys, Nike aired an ad that took a swipe at the Trump administration and the GOP. The add focuses on equality. The ad opens with the question, "is this the land history promised?" it then goes on to say, "opportunity should not discriminate...equality has no boundaries." Nike and Addidas are part of a collective of over 100 American companies called the Affordable Products group. These companies are fighting the Trump Administration’s planned import tax. The collective will launch a national advertising campaign in order to argue that a tax would increase consumer costs. The fact that American businesses including Tesla, SpaceX, Apple, Facebook, Google, Microsoft, Uber, Reddit, Netflix and Dropbox are suing Trump after only three weeks in office speaks volumes about this administration. It specifically dispels the myth that this administration is good for business. It is no small irony that Elon Musk is the CEO of Tesla and SpaceX as well as a member of Trump's business advisory council. Patagonia and a number of other leading outdoor retailers are also taking on Republicans. They are organizing to actively oppose plans to sell off public lands. Large numbers of people are looking for ways to express their displeasure at Trump and boycotts against America's first family are now spreading like wildfire. Boycotts are effective. Just the threat of a boycott caused Kellogg to stop advertising on Breitbart News (formerly run by Trump's chief strategy advisor, a white supremacist named Steve Bannon). Kellogg's official explanation of the move cited their corporate values. The Democratic Coalition Against Trump has produced a free "Boycott Trump" app (available on iTunes and Google Play) that helps people to avoid the dozens of businesses connected to Trump. For a list of Trump brands to boycott click here. Retailers are also thinking twice about the possible costs of being associated with the Trump family brand. Early in February Nordstrom announced that Ivanka Trump's clothing and accessories were not selling well so they decided to discontinue the line. Predictably, her father took to Twitter to lash out against the department store chain from both his personal account and his official White House account. Other retailers that are reducing the profile or dropping Ivanka's product line altogether are T. J. Maxx, Marshalls, Neiman Marcus, Belk, Jet, ShopStyle and Kmart. In a New York Times interview, Donald Trump jr. and his brother Eric called Nordstrom, "disgusting". To make matters worse Trump's tirade was reiterated by White House press secretary Sean (angry-man) Spicer and Trump's top White House adviser Kellyanne (look-at-me) Conway. This is not the first time the press secretary has played pitchman for Trump. Earlier this year he urged people to visit the Trump International Hotel in Washington. However, Conway went even further telling people in a Fox News interview to "go buy Ivanka's stuff". "It's a wonderful line. I own some of it," Conway said. "I'm going to give a free commercial here. Go buy it today, everybody. You can find it online." As a member of the White House staff this is clearly prohibited (federal employees are not allowed to use public office for the endorsement of a product). Companies are realizing that there may be a cost to political neutrality in the era of Trump. Retailers are the latest to have joined the army of companies opposing Trump. For many, the last straw was the Executive Order (EO) that banned seven Muslim nations. Nordstrom was among a long list who disagreed with both the ethics and the logic of this move. In a notice to its employees, Nordstrom said it valued immigrants and offered support to those affected by the executive order. Businesses are fighting for different issues but they all may derive a reputational benefit from resisting Trump. Far from taking a risk, engaging in social action is becoming a competitive necessity. This is a powerful incentive that may further weaken the Trump administration and the GOP. Businesses are realizing that being socially responsible can be good for a brand. Resisting Trump may contribute to both their reputation and their bottom line. "brands have not only an opportunity, but also a responsibility to defend inclusivity...Now more than ever, brands are in the political spotlight and have begun to understand the gravity of this, their influence, and even how to shape this climate into an opportunity. Brands now have a particularly visible chance to test — and even strengthen — their purpose, values, and courage." Maintaining control of the narrative is about being bold, that means being, "upfront about your brand's position...being courageous and outspoken about your brand’s values is key in today’s world." "brands are starting to tap into the enormous influence they have over popular culture and are starting to lead us toward a brighter future. Brands can use this influence to encourage diversity, bridge divides, further our common values and benefit from this elevated leadership status along the way...Brands have the power and influence to change our current divisive cultural climate into one where people connect with each other and accept one other’s differing positions in healthy discourse." This is not only good for cementing loyalty with many existing customers this is good for shareholders. Standing up to bullies like Trump may be a case in point. What was once considered to be an "activist brand" is now "a necessity". Brands sell products, but they also have "enormous influence they have over popular culture" and they can play a pivotal role in leading us towards a brighter future. What makes this so incredibly powerful is that taking a stand is not only good for connecting with consumers, it is good for shareholder value. After being attacked by Trump Nordstrom stock appears to have taken off. This suggests there may be brand value and stockholder benefits associated with opposing Trump. The growing trend of businesses opposing this government give us reason to hope that America can resist Trump and the GOP.